For a politician who’s had millions of words written about his fiery temperament, his meteoric rise through the House of Representatives and his unfortunate sexting that brought it all down, none of them have said as much so perfectly as a single moment in “Weiner,” when the former New York congressman Anthony Weiner’s appearance on MSNBC’s “The Last Word with Lawrence O’Donnell” goes horribly awry. In an effort to boost the prospects of his comeback bid to be elected mayor of New York, Weiner is lured to an empty studio at 30 Rock to be interrogated by O’Donnell, who a producer tells him only a few minutes before will be beamed in from Washington – which is more time than civility lasts during their actual chat since the host’s opening line, “What is wrong with you?” doesn’t leave much room for a reasoned conversation. Josh Kriegman, who was shooting his first feature after leaving a career in politics behind, saw there weren’t many positions to shoot from as Weiner was left to respond to a monitor rather than a person, but found the ideal one that allowed the vast blackness of the rest of the studio where no one was there to listen overwhelm Weiner as he defended his character, making cogent points perhaps, but shouting into the void nonetheless. Real is the operative word when it comes to “Weiner” since there doesn’t seem to be a single inauthentic second in the film, a seeming impossibility when profiling one of the most scrutinized political figures in recent memory. Such remarkable access was granted to Kriegman and Steinberg due to former once working for Weiner as his Chief of Staff, yet “Weiner” quickly transcends the shock of how the directing duo captured what they did to become the most brilliant portrait of what it means to be a politician in the 21st century yet rendered. Embedded in the media mob that followed his every move on the trail during the 2013 New York mayoral race, then allowed to stay by his side once behind closed doors, whether in the Escalade that shuttles him from one stump speech to another or in the flat he shares with his wife Huma Abedin and their young child, the film casts an unflinching eye upon the candidate who captured the public’s imagination with his unfiltered straight talk and bravado before those qualities turn out to be his greatest liabilities. 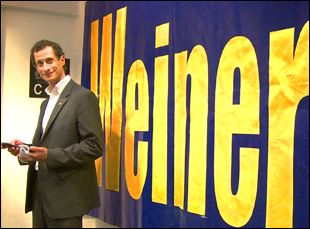 Even if his sexual indiscretions hadn’t been aired in public, “Weiner” would’ve made compelling cinema as Kriegman and Steinberg fully realize the media maw fed by Weiner’s run and the apparatus of the campaign to combat it, but in following the former congressman’s bid for redemption that in some ways mirrors his earlier rise and fall in miniature, the film embodies the best attributes of its subject – radiantly intelligent and riotously funny at times – with the ability to be continually unpredictable, even for those who closely tracked the race that Bill De Blasio eventually won. As the film makes its way to theaters after winning the Grand Jury Prize for documentary at Sundance earlier this year, the co-directors reflected on the wild experience of picking up their cameras the first day of Weiner’s run with no prior notice and not putting it down until the campaign was all over, having such a charismatic subject and the meticulous editing work they did to create an intimate character study and a broader illustration of running for higher office and the current media landscape. If it’s true you didn’t know until the day Weiner announced his campaign that you’d be making a film, was it difficult to mobilize quickly to start rolling the camera? Josh Kriegman: He did agree [to the documentary] on the morning that he announced he was running, but it was a conversation that he and I had actually been having over the course of a couple of years. I was his Chief of Staff when he was in Congress, and then moved into filmmaking, so it was after he resigned from Congress that I pitched him this idea of doing a documentary [because] Elyse and I are always looking for character-driven verite documentaries. That’s our passion, and the stories that are most exciting to us, so when Anthony Weiner said, “Yes, you can film my mayoral race, and I’ll open up my life to you,” we had to jump at the opportunity. It was just a matter of me picking up a camera, running over there and starting to film. As a filmmaking team, did that create an interesting dynamic, with Josh being personally familiar with Anthony and Elyse coming in as an outsider? Elyse Steinberg: I didn’t know Anthony, so in many ways, I was just like the audience. All I saw was what I had read in the headlines, so I came in with my own preconceived notions of him. When I met him and I looked at the footage, I realized he’s so much more of a complex and fascinating character than the character he has become [in the public’s mind], so that was just the perspective that I brought into it and both Josh and I really want, in this film, to take somebody who has just been ridiculed to a punchline and offer a more nuanced and complicated portrait. Josh Kriegman: Having worked for him and known him well for a number of years, I knew what a dynamic and multifaceted guy that he was and, as Elyse was saying, it really was in contrast to the punchline version of him that emerged in the course of his scandal and his resignation, so we really were eager to stick with him and to have it be a verite experience for the audience, that feeling of really being by his side through all the ups and downs and the chaos of the campaign as it unfolded. The film is fascinating structurally because it’s continually moving forward chronologically, but within that, you’re able to group scenes thematically or around a certain character trait of Weiner’s. Was that difficult to get to? Elyse Steinberg: We had an incredibly talented editor named Eli Despres who we worked with for about nine months to craft this story. With an election story, it had a natural arc – a beginning, middle, and end – and the timeline of events fit very naturally in a three-act structure, but there were definitely challenges. One of the things that was important for us, stylistically, was to show the headline, the public story, the news clips, the newspaper headlines, and then, the behind-the-scenes story, the story vehicle trope we used throughout the film that you see. You see what’s being played out on MSNBC, then you see the behind-the-scenes story, which bringing humanity to what was the crazy media firestorm, showing what it’s really like in the midst of it all. Was that inspired by the experience of personally witnessing some of these things and then see how it was chewed over in the media immediately after it happened? I’m thinking about the moment in the bakery in particular where Anthony lashes out at what seems to be a stray comment from a passerby, but actually turns out to be more insidious. Josh Kriegman: That represented a lot dramatically in the sense that here was this moment where Anthony gets into this really dramatic shouting match with a customer in a bakery, as he was doing some retail politicking and at first, it was the Washington media reporting it as Anthony having a meltdown on the campaign trail, and really losing his cool, which played out in the media immediately. It got picked up. It was very sensational. Then, as you see in the film, the whole narrative turned completely when it was revealed that, actually, Anthony was responding to a racial slur that this customer had muttered about Anthony’s wife [which], of course, gave the whole episode a completely different narrative. It’s emblematic for us – and this is something that we hope the movie speaks to more generally, beyond Anthony’s story – of just how our media functions today, and how much the political conversations and our culture in general is driven by this insatiable appetite for spectacle and entertainment. To watch that play out in real time was the perfect encapsulation of that theme. The various montages of the media coverage also seem carefully considered – showing how the report of a less reputable source can quickly rise to the level of the top publications in the mainstream. What was it like to put those together? Josh Kriegman: One of the challenges was [considering how] late night comedians and headline writers, and cable news pundits had a field day with this story – obviously putting puns on his name and what happened – to acknowledge and capture that because it was so much a part of how it all unfolded, but we didn’t want to pile on. We didn’t want to make the easy joke or and we really wanted to find the humanity behind this flurry of sound bites and headlines that had come to define the whole episode. Elyse Steinberg: From a storytelling perspective, we wanted to do a lot [in those montages] – tell the backstory, get across some of Anthony’s personality, but also show the way in which things moved so quickly. You have [Weiner] screaming on the House floor, then that goes viral, then it’s on the talk shows and it’s in the headlines, which speaks to this larger theme about how politics have become about entertainment and spectacle. Even though it’s verite, did you have certain ideas about how to shoot it before rolling the cameras? There are distinctive elements in terms of some of the reaction shots and how you’ll pull back to see just how much of a media swarm there was. Josh Kriegman: When we started shooting, we had a cinematographer with us who is really quite talented – Sean McGing, someone that we’ve worked with in the past – and we thought that we would have sort of a director/cinematographer combo, but it became pretty clear pretty quickly that there just wasn’t room for that. Physically, and just in terms of the dynamic of the situation, the only way to really make a film like this was have it be a one-man band and it seemed like that person should be me, so I really just picked up a camera, and was charged with the task of capturing everything as well as I could. In many respects, I was folding in with the media, but we also knew that we wanted to take a step back and capture the media itself as part of our story. Certainly, stylistically, that was a choice we made early on. Elyse Steinberg: We also didn’t want Josh to be a character [in the film], but we did want to acknowledge his presence because it was important from a story perspective, so while we were in the edit, [we crafted the story so] you see those incidents. Was there just one sit-down interview with Anthony after it was all over, or did you set up moments throughout where you talked to him? Elyse Steinberg: We just did one, which happened about three months after shooting. Josh Kriegman: Obviously, there’s a lot of different ways to tell the story. We considered the possibility of doing a host of interviews, talking heads, and commentary. Fairly early on, it became clear that what we were excited about was that real visceral verite experience because we understood what we were capturing, and we knew that we wanted to really limit the talking head experience to just Anthony. The experience of watching the film is really being with him, and, in some ways, getting inside of his head through the course of the campaign. It’s not spoiling anything, was there a particularly crazy day of filming for you? Josh Kriegman: Having seen the film, I’m sure you would not be surprised to know that there were many crazy days, given the way the events unfolded. Election day itself was so packed with so many different things happening we had to put in a countdown clock so you could keep track of everything that was happening throughout the course of the day. We ended up having multiple cameras and you don’t often think when you set out to make a political documentary, that it is going to culminate in a chase scene, so that was a pretty crazy day. After it was over, did you have a different impression of Weiner than you had at the start? Josh Kriegman: No, my experience of filming and then of crafting the story was really doing our best to capture the complexity of him, and the nuance. He certainly had his flaws, which we’re all aware of, but you also see these extraordinary talents. The intention really was to try to do our best to capture his whole person. Elyse Steinberg: Yeah, I met him and I saw just a completely different side than the headlines I had read – a human side to him, and through his interview and his offering some honest thoughts and reflections on himself, I think that comes through in our film. He is a complicated character. You see that on the one hand, he has this immense insight and self-awareness, and, on the other, a kind of blindness, so that complexity of his character was fleshed out in my experience with him and hopefully, that’s the expression of the film itself. 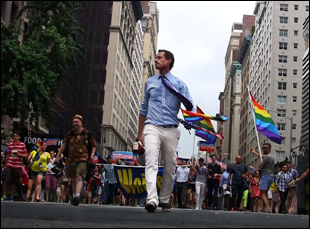 “Weiner” opens on May 20th in Los Angeles at The Landmark and New York at the IFC Center.